Container plantings are pretty, but they’re not just for decoration. 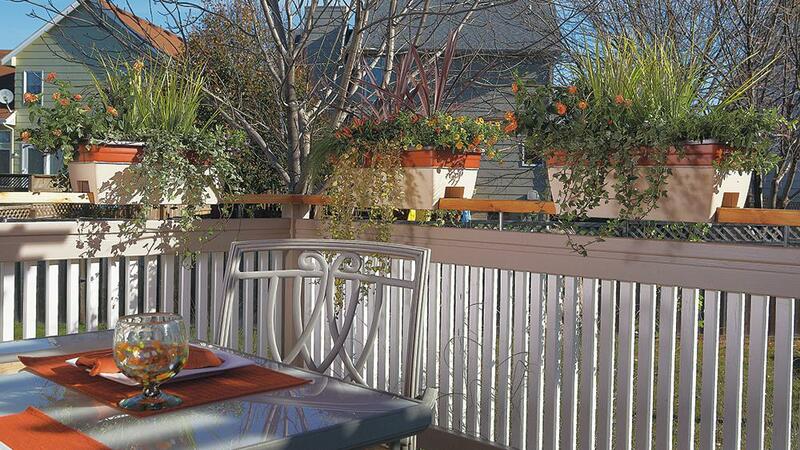 On this deck, containers do the work while you relax and enjoy! Sometimes, creating privacy is more about the perception that you’re not on display, rather than screening out every glimpse of neighbors’ houses, decks and patios. Even with the new deck rail and an umbrella overhead, this outdoor table still felt too open. You could plant a screen of trees and shrubs, but you’d have to wait years for that solution to really work. And there’s not enough room behind the table to do a grouping of tall containers. Instead, we went with a space-saving solution — deck rail planters. Although you often see hayrack planters mounted on the sides of decks, we wanted something that would sit on top of the rail, right at face height while you’re sitting down. We could have squeezed in a couple more of these planters, but we wanted the plants to be able to billow out the ends. So we placed them strategically along the rail. Although these planters are pretty stable on the rail when they’re full of soil, they are made of lightweight plastic so it’s possible to lift them down if strong winds are forecast. Below, you’ll see plastic plugs at the bottom for drainage. Pull these plugs out before you fill the planters with potting mix. Otherwise, your plants will stand in water every time it rains, and they’ll rot. 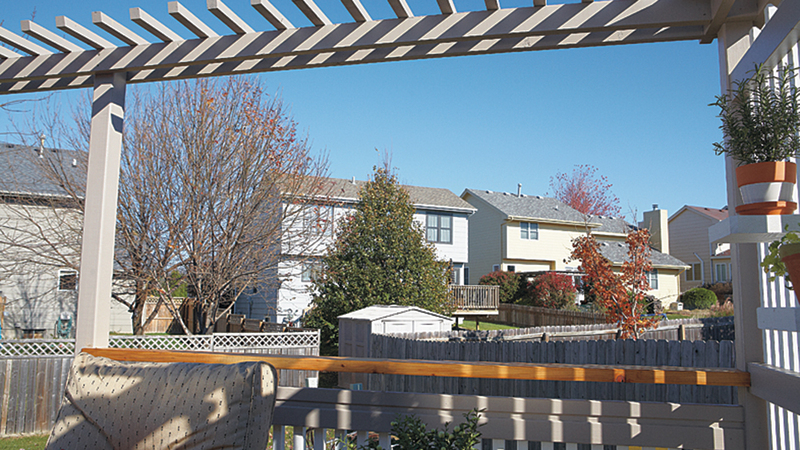 The screen and overhead pergola give this corner shelter, but there’s still a full view of neighbors’ decks. Hanging baskets, hung close together, provide an effective screen for the seating area. Once we saw how effective the deck-rail planters were at improving the feeling of privacy, we looked around to see if containers could help us out elsewhere. The overhead pergola structure attached to the new privacy screen helped shelter the seating area, but you could still see several neighbors’ decks. Those houses are slightly higher up the hill than the ones overlooking the dining area, so the screening needed to be higher, too. Hanging baskets were the perfect solution for filling the space and the chenille plants and Boston fern appreciated the little bit of extra shade they got from the overhead structure. You could hang these baskets in a straight row, but we liked the energized, asymmetrical feeling of hanging them at different levels. The lower heights also provide maximum privacy for anyone sitting on the love seat. Both Boston ferns and chenille plants can be overwintered as house plants, so you can enjoy them on the deck next year, too.